?2018 Kawasaki Versys? X-300 ABS? The Kawasaki Versys? stable of adventure bikes has something for everybody, beginning with the fresh new 2018 Kawasaki Versys X 300 ABS lightweight all-purpose performer. Other Versys family members include: the Versys 650 ABS and Versys 650 LT and the Versys 1000 LT. The Kawasaki Versys X 300 ABS is not only easy on the eyes, but is easy on the pocketbook, starting at $5,699. with ABS or $5,399 without. Expect to add an average of $250 for dealer prep and handling, which can vary. It is derived from the Kawasaki Ninja? and is powered by a 296cc twin-cylinder motor. It is really one of a kind, with its lightweight chassis, long-travel suspension, wide handlebars, low seat height, initial affordability and economical operating expense. It is the ideal commuter, while also being satisfactory for long road touring adventures. The adventure bike category consists of motorcycles that are at home in the dirt or on the road, and the Versys X 300 ABS fills the bill as the ideal entry into the adventure field. Essentially, the Versys X-300 ABS (the ABS is definitely worth the extra $300.) is loaded with features and benefits that one would normally only expect to find on larger, more expensive bikes in this category. The 296cc, DOHC, 4-stroke, water-cooled, parallel-twin motor with 2 DFI 32mm throttle bodies and TCBI with digital advance produces a claimed 39 horsepower and gears its motive energy to the rear wheel via a six-speed sequential manual return shift transmission that?s cable actuated, with a wet slipper clutch, assist and a positive neutral finder. The final drive is a sealed chain. The torque figure was not listed, but the motor is tuned to deal favorably over a wide range of riding scenarios. The Versys X-300 motor and gearbox mounts in a rigid tubular diamond design frame with 41mm telescopic reverse forks up front with 5.1 inches of wheels travel and a bottom-link Uni-Trak? 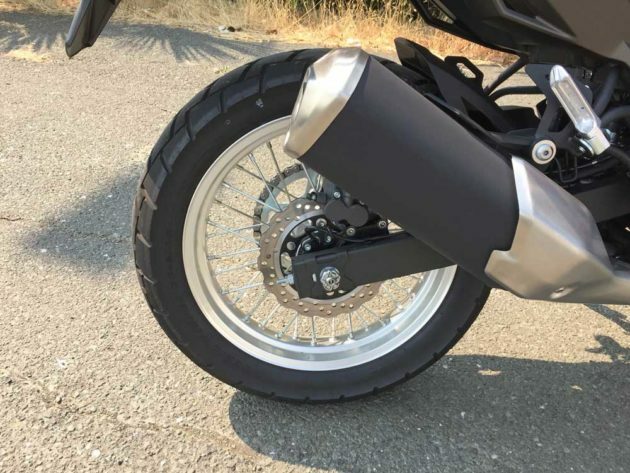 swingarm rear suspension with 5.8-inches of wheel travel bringing up the rear. The subframe is incorporated into the main structure, and the rear shock mount is beefier to handle a variety of riding adventures. The rake is 24 degrees and the trail measures 4.3-inches. Rolling stock consists of IRC Dual Sport (multi-purpose) tires 1000/90-19 M/C 57S in front and 13/80-17 M/C 65S rubber aft, mounted on lace-spoke, aluminum rims all around. 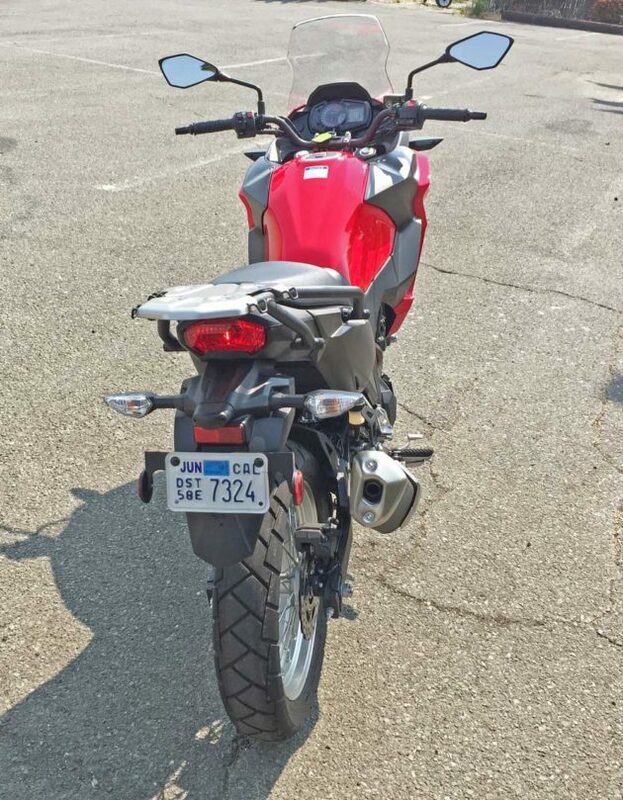 The dimensions of the Versys X-300 are rider friendly except for the seat height, which is a lofty 32.1-inches, and the handy trunk mount kicks up at the rear making it difficult to throw one?s leg over, and necessitating sliding over at mid-seat, where hanging a pants leg up on the mid-positioned foot rest is a possibility. Otherwise, the overall size of the bike is ideal, and it provides 7.1-inches of ground clearance. The design of the Versys X-300 of the bike is bold and rugged featuring the look of a rally bike. 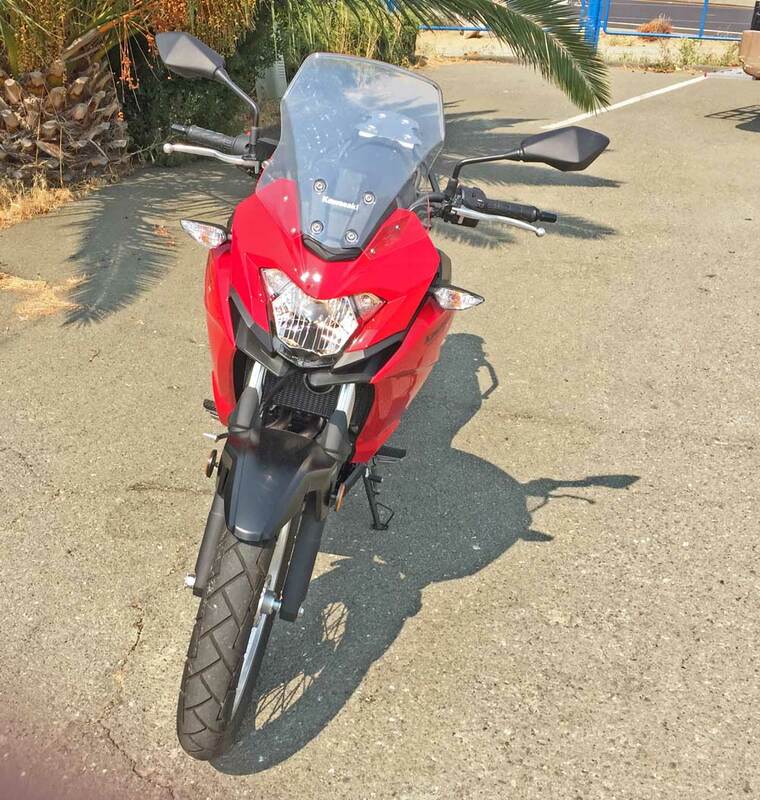 At first glance, the impression that?s served up is that of a bike with much larger engine. The upper cowl is indicative of Kawasaki?s athletic DNA and it?s fitted with a substantial windscreen as an added comfort feature. Air ducts placed beneath the headlight aids in the reduction of hot air build up within the cowl, and the large side cowl opening is also effective for heat dissipation from the radiator. 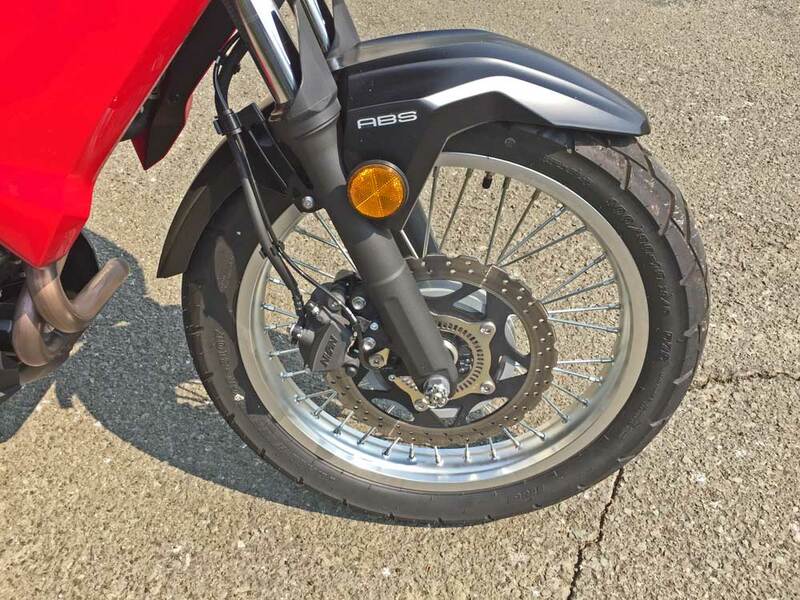 Contributing to the bike?s adventure look, is the lower engine guard that appears to cradle the engine. 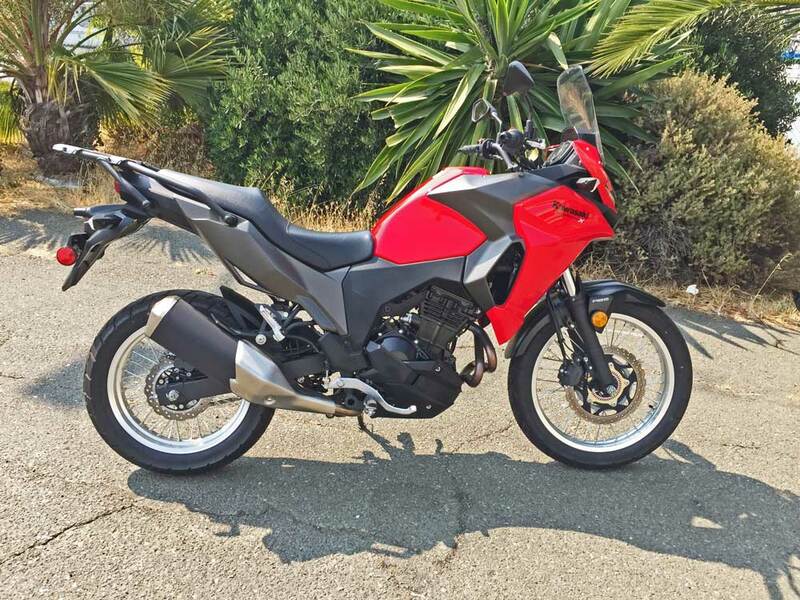 My test 2018 Kawasaki Versys X-300 ABS came with the base price set at $5,699. Eliminating ABS saves $300. 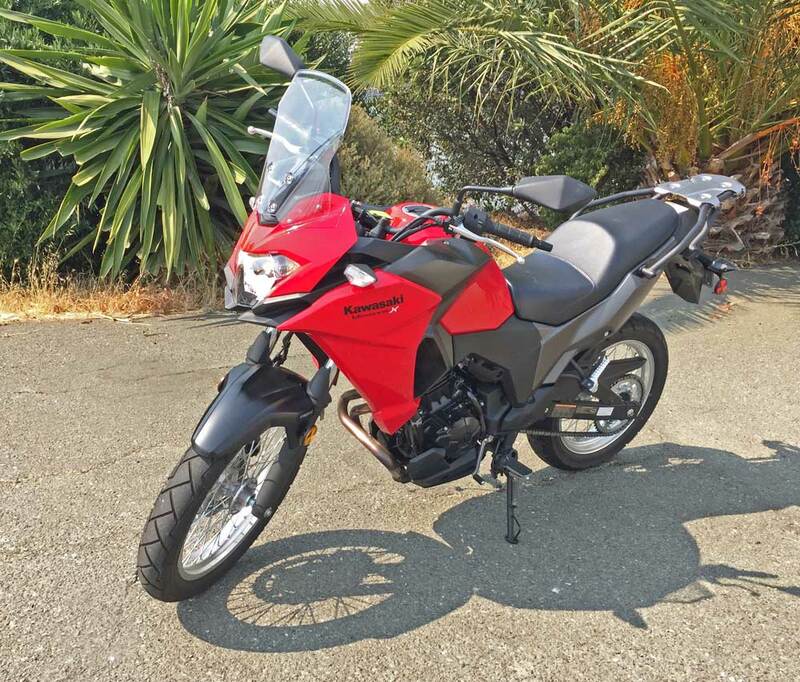 Which would likely cover dealer handling and prep charges, but the bike represents such a bargain anyway, why not go for the gusto. My test ride was finished, not in Kawasaki?s traditional Bright Green, but rather in a new Passion Red metallic and Flat Raw Graystone finish. The other available color is Metallic Spark Black/Metallic Flat Raw Graystone. An ABS equipped Versys X-300 will run roughly $6,199 before tax and license. The 2018 Kawasaki Versys X-300 ABS is essentially a lightweight, high revving machine that?s suited to virtually any adventure challenge. It?s fun to ride and forgiving with its comfortable upright riding position and excellent balanced ride quality. Taller riders may feel cramped with the mid-positioned foot pegs and controis. At 6?4? I would have been happier with forward pegs and controls, but then, I?m more cruiser oriented. 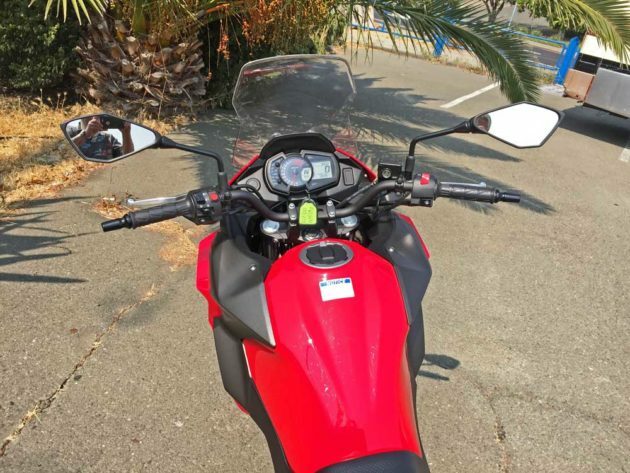 The Versys handles well at low or high speed, and it?s minimal mass promotes confidence in maneuvering through ?twisties?. There is a host of available factory accessories for the X-300 to enhance more pleasurable long range rides, such as hard detachable luggage (side bags and trunk pack), along with protective crash bars, driving lights and hand guards. Acceleration comes quickly and responsively and the broad torque range is ideally suited to both low and high rev scenarios. The flat rear carrier platform is level with the seat, which features a large diameter rear grab bar for passenger comfort and security. The healthy fuel-injected, counterbalanced parallel twin derived from the Ninja 300 operates smoothly from just above idle to ITS 12,000 RPM redline. Price as Tested: $5,949. Add $250. for dealer prep and handling?Note: Dealer handling and prep may vary. Transmission: Six-speed sequential manual return shift, cable actuated, wet clutch. Drive Train: Sealed Chain Final Drive. Suspension: Front ? 41mm Telescopic forks with 5.1 inches of wheel travel. Rear -.Uni-Trak? swingarm with 5.8 inches of wheel travel. Brakes: Front ? Hydraulic 290 mm petal cut Single Disc, ABS. Rear ? Hydraulic 220 mm Single Disc with dual pot caliper, ABS. Tires: IRC Dual Sport (multi-purpose)- 100/90-19M/C 57S front / 13/80-17 M/C 65S rear mounted on lace-spoke, aluminum rims.